I had just watched the most incredible horse to ever live outdistance the other horses in the final race of the 1973 Triple Crown by 31 lengths. In the beginning of the last stretch, the 3-year-old began pulling away from the other horses as though they were standing still. His stride lengthened and then lengthened again, his hooves gathering the earth beneath his feet and sending it flying long after he'd left the other horses in his dust. No one could believe their eyes. I had a lump in my throat and tears in my eyes as I watched him cross the finish line with apparent ease and keep on going until reigned in. His jockey, Turkotte, said he never had to push him. Secretariat won that race in 2:34 flat. His record stands to this day. "His only point of reference is himself," said legendary sports writer Charles Hatton. I don't know that I or anyone will ever see a greater horse. Talk of Secretariat and photographs of him were everywhere. This was no ordinary race and this was no ordinary horse. Most realized they had witnessed greatness. What Secretariat seemed to have more than any other horse was an indefatigable love of racing and an absolute will to win. 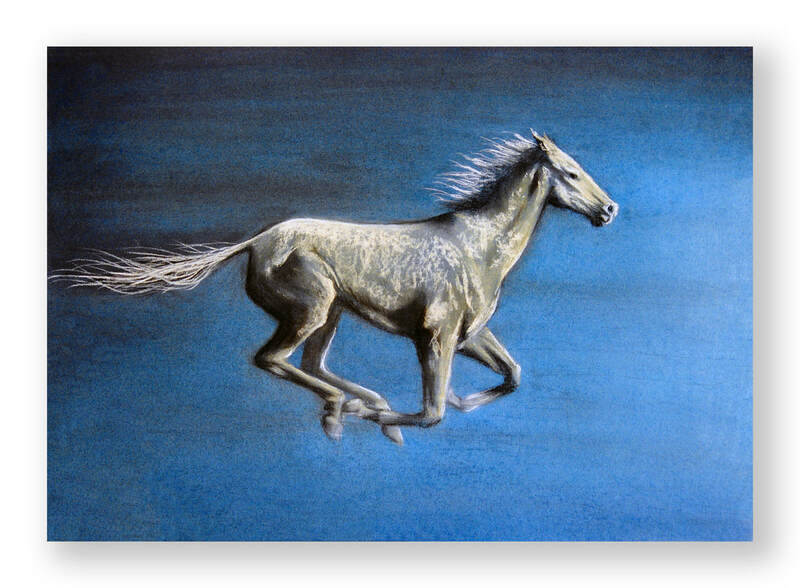 I can paint photorealistic portraits of horses, but it was this spirit more than flesh and blood that I wished to capture as I put chalk to paper in Race with the Wind. Secretariat lived another 19 years. There would be more races, new records, a couple losses and nearly 700 foals birthed before he retired. In his retirement, visitors could come by appointment and watch him frolic in his pasture. Secretariat's paddock bordered three other stallions, among them another Hall of Fame inductee, Spectacular Bid. Secretariat did not pay much attention to his other two neighbors, but he and Spectacular Bid became friendly and sometimes raced along the fence line between their paddocks entirely unbidden by bugles and fanfare. Often, some have said, he could be seen racing with the wind.